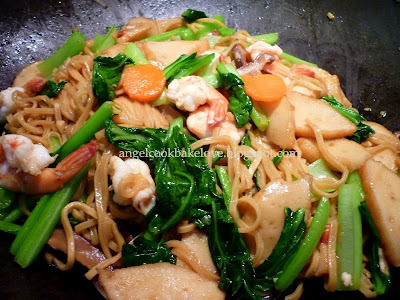 1) In a wok, heat little vegetable oil, add prawns and give it a quick fry, remove when the prawns change colour and curl up (about 80% cooked). Add choy sam and stir-fry till become almost cooked. 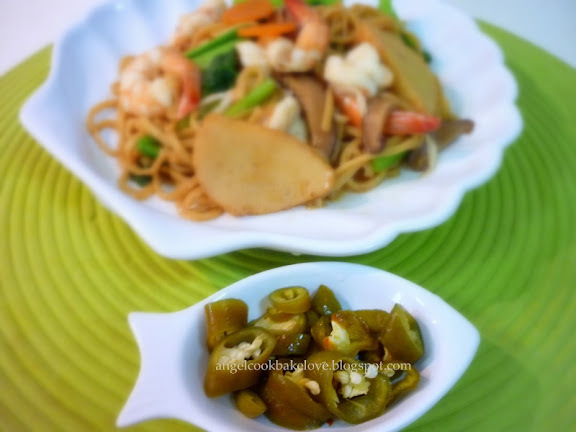 2) Add vegetable oil + sesame oil, when it is very hot, add in garlic and saute till fragrant. Add carrot, mushrooms and fish cake, stir-fry briefly before each addition. 2) Add braising sauce and simmer till a gentle boil. Add in Ee Fu noodles, making sure you submerge them in the braising sauce as much as possible. Cover with a lid and let the noodles stew in the sauce at low heat for 2 to 3 minutes. Open lid and check for doneness. 3) Return prawns and choy sum to the wok. 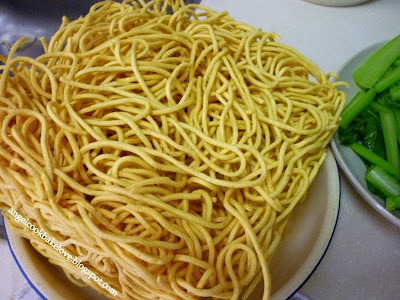 Gradually add little hot water if the noodle is not cooked yet and continue to simmer till al dente. 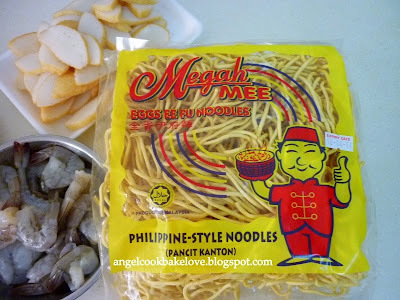 Meanwhile, taste the noodle, add more seasonings if required. If it is too salty, add a pinch of sugar. 4) Serve immediately with vinegar-marinated green chili. u are making me hungry angel save me a plate will ya! looks so yummy! 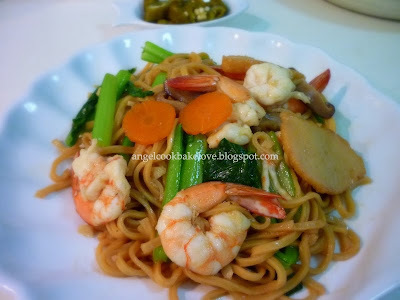 I like to prepare this simple noodles for lunch too.